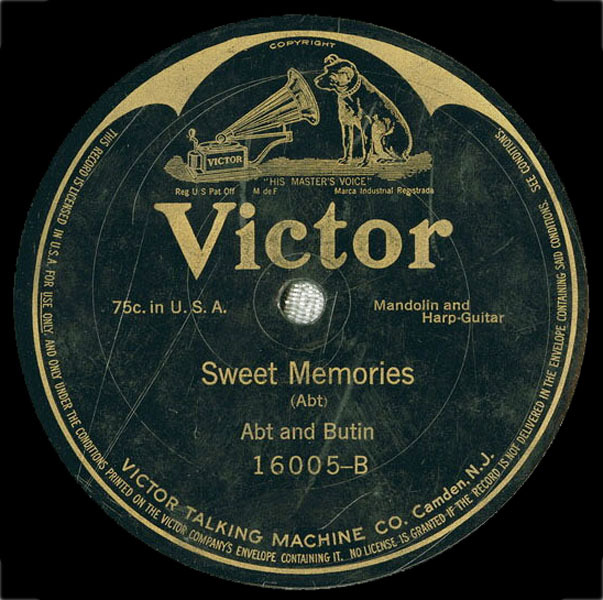 Researchers and fans of the earliest recordings of American mandolin and guitar music have long known the name of harp guitarist Roy Butin. 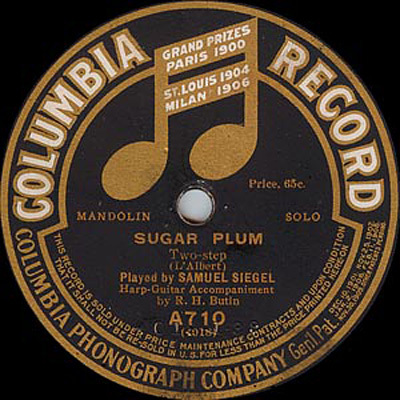 His name appears (for the most part) on over a dozen early cylinder and 78rpm recordings of once-famous mandolin players Samuel Siegel, Valentine Abt and W. Eugene Page. 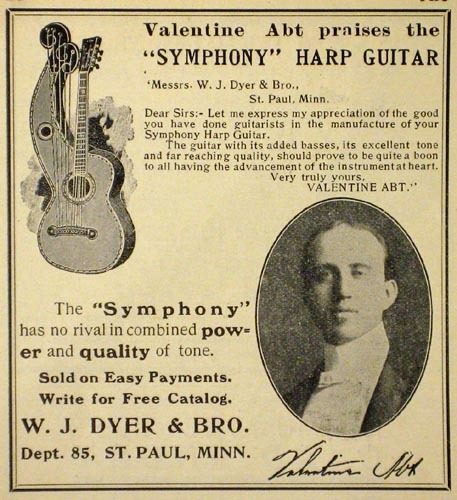 Sadly, these names seem all but forgotten today, except to serious mandolin historians, classical mandolin players, and fans of early plucked string recordings. However, they do manage to crop up – again and again – to those of us who pour through available copies of old Cadenza and Crescendo magazines for clues about fretted instruments and music in turn-of-the-last-century America. Curiously, the name of Roy H. (Hunter) Butin is completely absent from these important journals. How his two decades of highly visible activities seem to have completely escaped the attention of the magazine editors and the BMG (banjo, mandolin and guitar) community remains an unanswered mystery. Indeed, we only known his name because it appeared alongside the names of these mandolin virtuosos. Almost nothing is known about this important musician, so I'm glad to finally have a reason and opportunity to do this short piece on him. 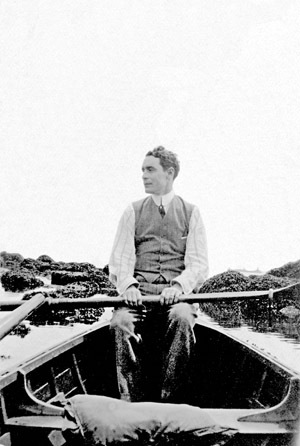 This article was prompted by the discovery of the first photos of Roy contributed by a descendent of one of Roy's close New York friends, kept safe and handed down through four generations. That story appears on my blog here. All who read this article have Carol Stephens to thank for generously donating these photo treasures (and her painstaking internet searches) to Harpguitars.net and thus, the world. Enjoy! 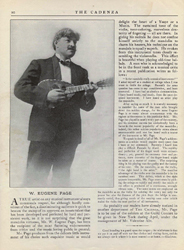 From the mid-1890's and well into the 1920s, month after month, the Cadenza and Crescendo magazines would feature news of the up-and-coming mandolin virtuosos. Three of the most prominent were Siegel, Abt and Page. 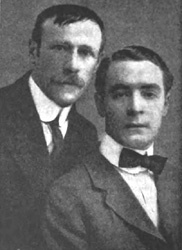 Siegel and Abt (who also became a harpist) were regularly mentioned in the Cadenza almost from the beginning (c.1896-1898). Page would be featured a bit later. Siegel and Abt appear in Paul Sparks' The Classical Mandolin (1995), and here and there as footnotes in mandolin history. 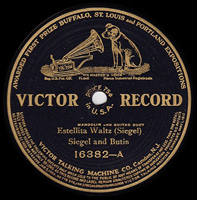 Siegel successfully moved from the vaudeville circuit to the concert hall and was soon "widely regarded as the best American performer" (Sparks). 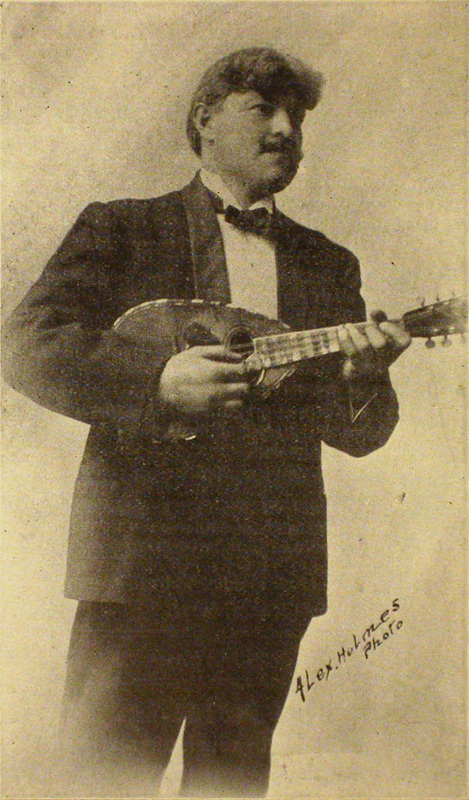 Unlike most other early mandolinists, he never studied the violin. 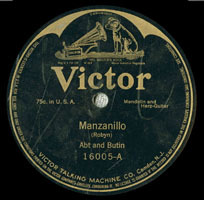 He was quick to begin composing original new music for mandolin (which were notated for him, as he did not read music well). He was the second American mandolinist to record (but first on disc). 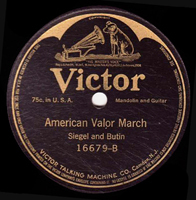 Strangely, though Siegel was discussed and raved about (and personally took out monthly ads) in the Cadenza, he seems never to have received an artists story or "Members Profile" ("Members" of the American Guild of Banjoists, Mandolinists and Guitarists). 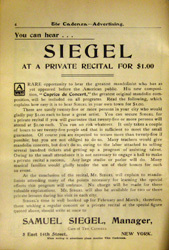 Also appearing in some 1902 Cadenzas was this full page ad (again placed by Siegel, who was apparently his own manager). Any Cadenza readers with a buck could get their own concert! 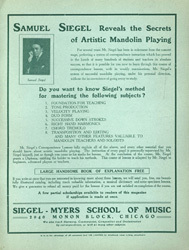 In 1911, Siegel had already retired from performing, but remained active as a teacher and method/music provider. Abt, originally a violinist, and later also a harpist, became another virtuoso mandolinist, specifically in the classical style. Though apparently not as popular as Siegel, he is feted in the Cadenza magazine like no other. I finally spotted the full page ads (far right) that explained why: Clarence L. Partee, Cadenza's owner/editor, was managing Abt! Interesting to see Abt's transition from the bowlback classical mandolin to Gibson's. Page became another well-known Guild member and convention performer. He would do quite well for himself on the Lyceum circuit. 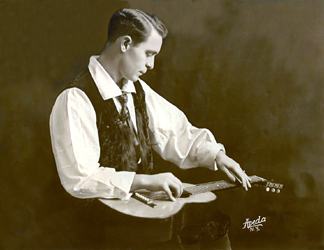 Like Siegel and Abt, he was often called "the leading mandolinist in America" and other such accolades. 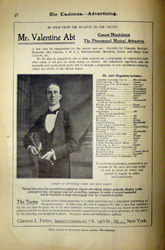 Interestingly, this Lyceum brochure advertises his performance on mandolin and mandola, along with banjo and marimba! 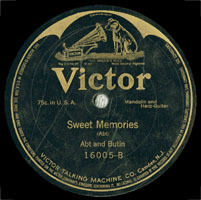 His two recordings with Butin would be Butin's last. Interestingly, Page had recorded one of those pieces and two others just five months previously with D. F. Ramseyer on harp-guitar. Nothing is known about Ramseyer. A nagging question: why did all three separate mandolin stars turn to Roy Butin as their accompanimist? They all had guitarist friends and playing partners amongst the Guild members (I do not know that Butin ever joined). Was it because Butin happened to be the New York session guitarist? 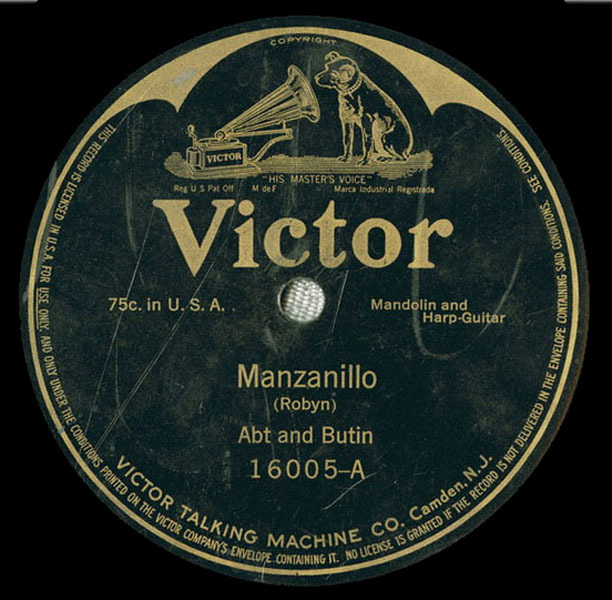 It is also surprising to see the record labels that in nearly every case give Butin equal credit with the famous mandolinists; in fact, they give the impression that "Siegel and Butin," "Abt and Butin," and "Page and Butin" are not just each a "duo," but a team. Perhaps this is just how the musician unions required credits to be listed; after all, no evidence has been found to show Butin as anything more than a hired accompanist. As it turns out, Roy Butin was part of a "team" - the popular musical duo The Olivotti Troubadours. Again "just" basically an accompanist, he was given equal billing in the press and record catalogs. 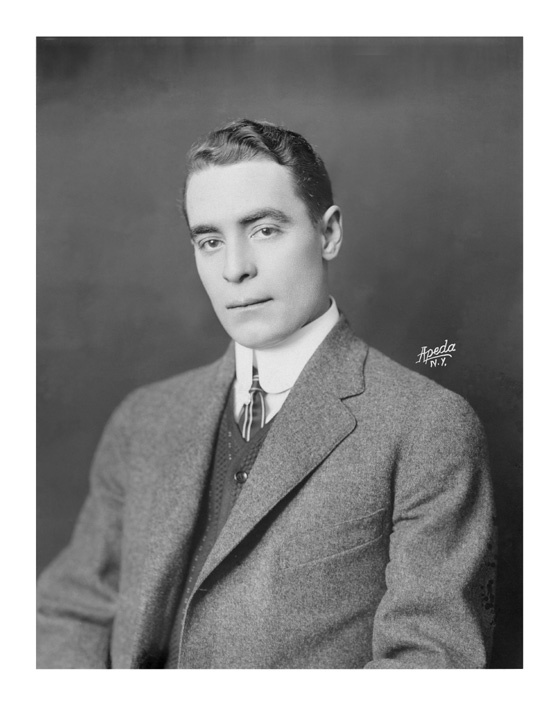 His partner was violinist Michael Banner (b. Sacremento, CA, 10/20/1868; d. New York, 10/30/1941), a child prodigy who had a long and successful (but sporadic) career as a classical violinist. 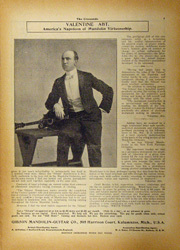 The January 20, 1901 New York Times included a review of his performance in Berlin with the Philharmonic, describing him as "one of the foremost violinists of the world." An April 30, 1922 NY Times review which describes a rare recital during his retirement mentions his c.1882 "appearance as a boy with the orchestra of Leopold Damrosch...in New York." From their many newspaper announcements (see Timeline below), the Troubadours appear to have been fairly busy from about 1906 to 1916. In 1909, they made just one recording, Edison Amberol cylinder #302 "The Carnival of Venice," an MP3 of which can be heard below. It shows Banner to great effect and Roy doing what he does best. 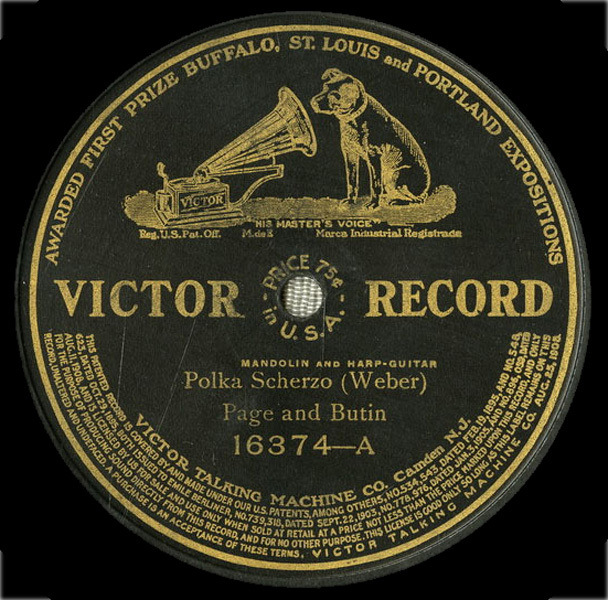 The Edison Phonograph Monthly (Sept, 1909) says of the release: "A charming violin and guitar duet by accomplished musicians. 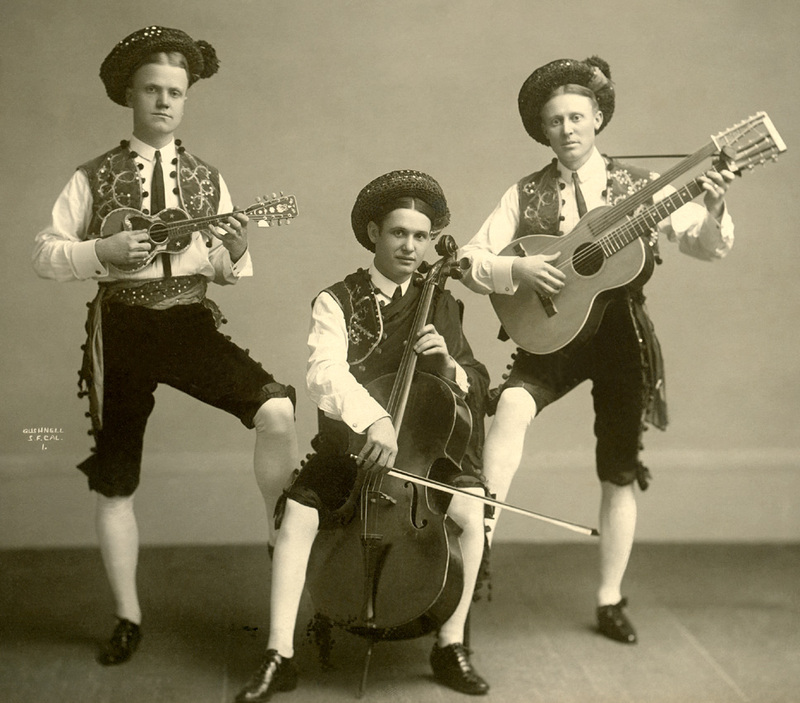 The "Ollivotti Troubadours" are well-known artists of high rank who have appeared with success at concerts and at the leading vaudeville theatres throughout the country for the past three years. 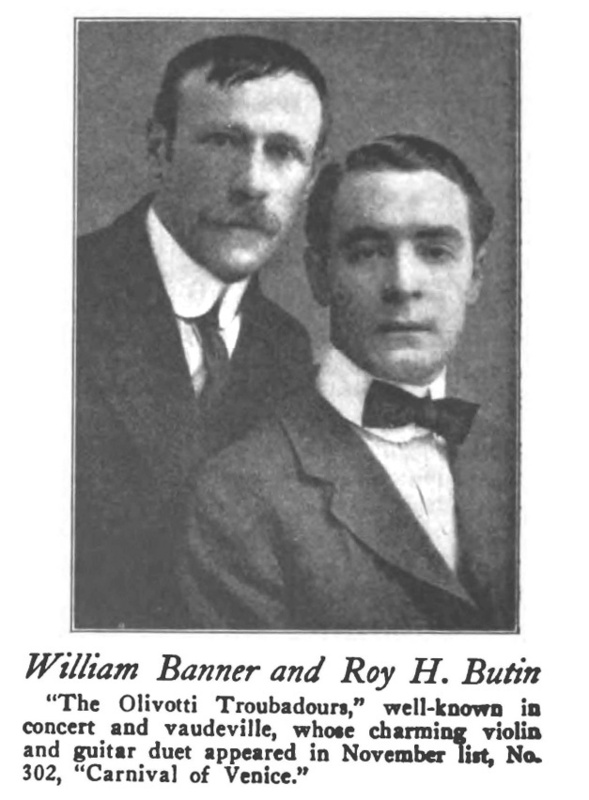 Mr. Michael Banner, the violinist, is a virtuoso of recognized ability, while Mr. Roy H. Butin, the guitarist, is equally proficient on his instrument. Arrangement by Paganini-Banner." This series of never-before-seen images include candid shots taken by Roy’s friends, all courtesy of Carol Stephens, whose great grandmother happened to be one of Roy’s good friends. Her name was Mary E. Bon (birth name) > Mary Thomas (1891-1893, while married to first husband George H. Thomas) > Mary Louise Michel (1907-on, after marrying John “Jack” Michel). She briefly danced in the Pony Ballet in the 1890’s (in which the girls dressed up as “ponies”). In 1893, though still married to Thomas, Mary lived with a musician named H. Francis Gurnsey (her “common law husband”), taking the name Louise Gurnsey (this is where her later new middle name came from. Thomas eventually divorced her). 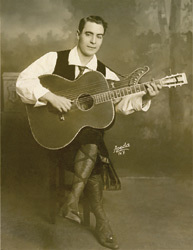 Gurnsey played banjo, guitar and harp guitar in a trio in San Francisco, New York and Montreal in the 1890’s. Carol (who beautifully Photoshop-cleaned all these priceless images) also shared this photo of the trio. 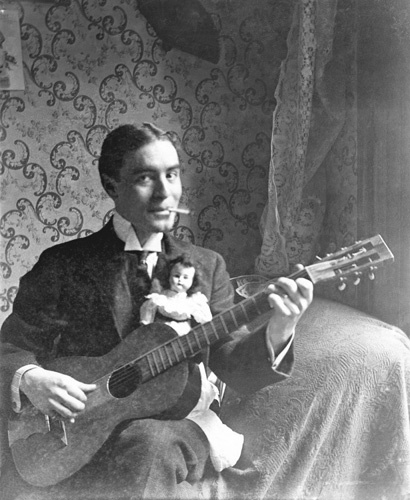 Gurnsey plays the well-known 1890s-1900s Lyon & Healy harp guitar. What icing on the cake! 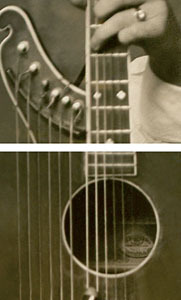 After a hundred-plus years, the world knows what harp guitar Roy owned – the rare and unusual "slab-neck sub-bass harp string attachment" Regal, made by the Wulschner company/companies. I've now added it to the growing Regal harp guitar page for comparison to the others. There are now two equally fascinating and frustrating areas for study concerning Roy's harp guitar: the recordings and what we are hearing (difficult enough), and now the stringing of his possible recording instrument. I defy anyone to tell me what those sub-bass strings might represent in the way of string material, gauge and pitch. The ridiculously short length of course doesn't help our calculations any! There is the possibility that Roy's sub-basses are tuned in a random pattern, an ascending (as opposed to normal descending) pattern, or with some of the strings pitched above the neck's E string. In fact, they could even be pitched well above. Additionally, he could have re-tuned them any which way for different keys and songs. I've a pretty good ear, but I don't seem to have a knack for analyzing the narrow bandwidth sound waves of scratchy, primitive sound recordings of stringed instruments. In the chart below, of the recordings for which there is access to sound files, I've listened and listened, but still can't tell what's going on. I do know now that he definitely has some traditional low subs - I have distinctly heard a low D, C and B. As today's harp guitarists know, that's really not a lot of low notes. Remember that he could have achieved those three notes from three individual strings, or from re-tuning (the C & D both appear in one recording). Obviously, he could have had another three lower notes and not happened to use them in these particular recordings. But I swear I'm also hearing higher open bass strings - akin to Stephen Bennett tuning, with its high G (= 6th string, 3rd fret pitch). At various times (and not consistently) I thought I heard a high open F, F# and a G (as opposed to hearing them fretted on the E string). If you think that's crazy, I could swear he sometimes hits a high open B and C (rather than the 5th string fretted notes)! The fact that he may be using this short-sub Regal makes me believe in the possibility of high basses. But I'll let others weigh in on that - refer to my comments in the table below and have at it! All Titles with links have audio files available. However, direct links to the song pages is not always possible. You will need to search the web sites of the UC Santa Barbara Library Cylinder Project and Victor Library for those particular titles. If anyone has additional recordings (and images) we are missing, please help! 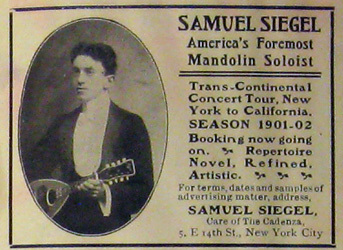 Southern Fantasie Samuel Siegel, mandolin 1908 Indestructible Record 890 Amaj No low subs? Open F? (high sub) G now sounds fretted? But his high C (5th string, 3rd fret) sounds open also? 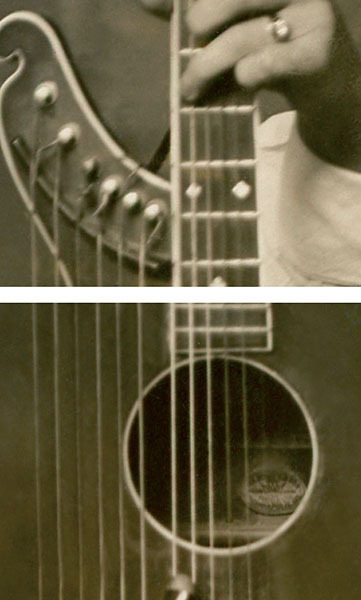 From The Edison Phonograph Monthly, April, 1909: "A mandolin and guitar duet by two experts on these instruments. The selection is an original composition by Mr. Siegel, the construction of which presents fine contrast and brilliant change, and affords a splendid opportunity to these artists to show a skilled and finished performance on these sweet-toned instruments." 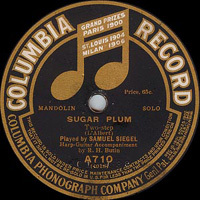 Sugar Plum Samuel Siegel, mandolin 1909 Columbia A710 (4018) Emaj Low D sub? Edison Blue Amberol 2060 G#? From The Edison Phonograph Monthly, Oct., 1909: A mandolin and guitar duet arranged in concert style and played by artists of national reputation. Any attempt to describe this number would fail to do it justice. It is an exquisite rendition of a charming composition. 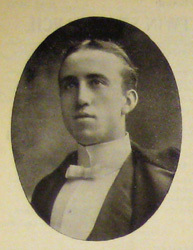 Composer, Samuel Siegel. Roy Hunter Butin was born in 1877 in Logan, Ohio, the son of V. Malvina Amelia Hunter (b. Oct. 19, 1854; d. Nov. 18, 1911) and Jesse B. Butin. In 1895, he was living at 376 7th Ave., Columbus, Ohio. In 1900, he was in Gore Falls, Hocking, OH, living with Levi and Margaret Black (listed as "nephew"). 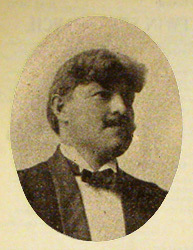 Circa 1900, he was in New York, presumably working as a musician. 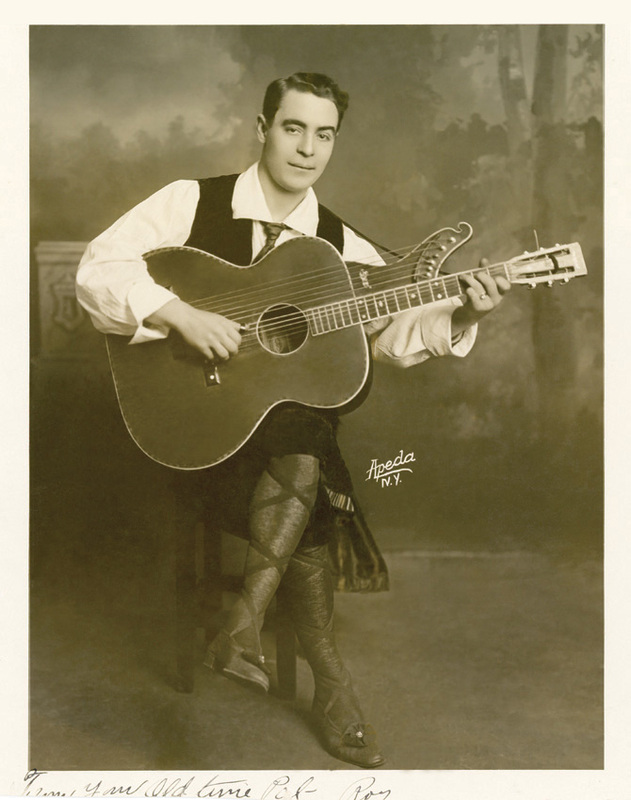 In 1906, he made his debut as one half of "The Olivotti Troubadours," with virtuoso Michael Banner on violin. They would make one recording in 1909 and successfully perform until at least 1916. In 1908, he made his first recordings - 4 with mandolinist Sam Siegel and two months later, 6 with mandolinist Valentine Abt. 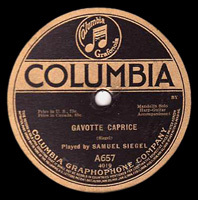 In 1909 he made 3 more sides with Siegel and 2 with mandolinist W. Eugene Page. In 1910, at age 33, he is still a successful musician in New York, but living with his parents. 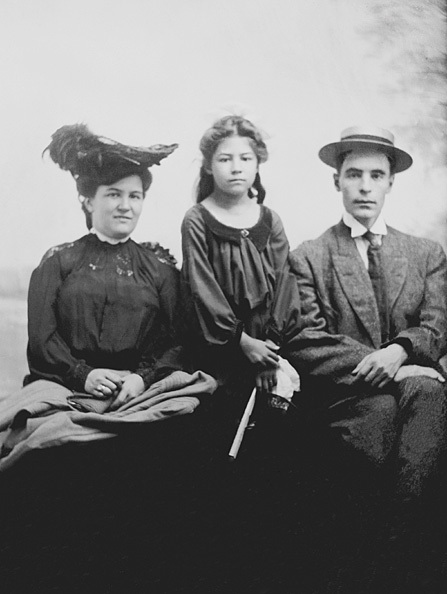 In 1912, he married 27-year-old Elsie (Elsa) Clare Sanford, an “actress in the theater,” in Jackson County, Missouri. In 1918, the couple (and Elsie's family) moves to 415 E. 17th St., Long Beach, California. He is described as a "self-employed actor." In 1922, while at the same residence, he is a "music teacher" at 319 Marine Bank Bldg. 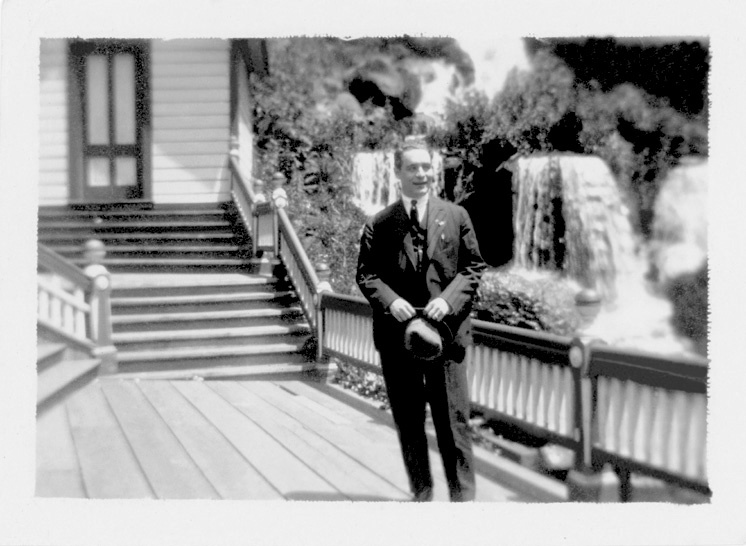 From 1924 to 1943, he moves to several different addresses in Long Beach and Los Angeles. He divorces Elsie in 1925. In 1930, he is living with Emma, his "housekeeper," whom he would eventually marry. 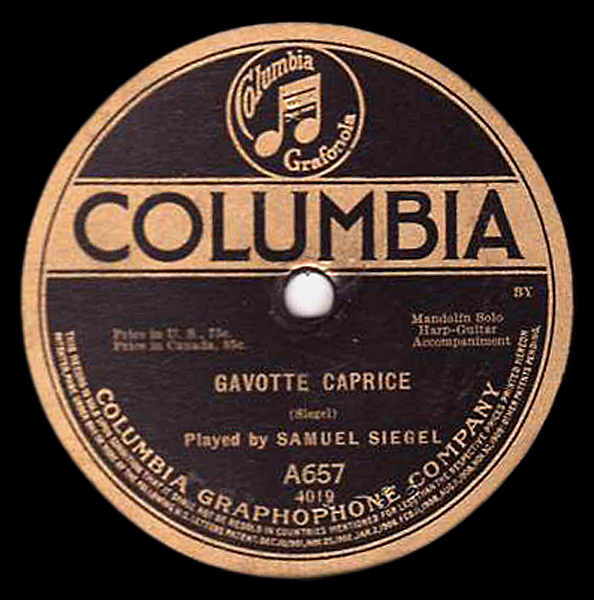 He is working as a musician or music teacher until at least 1936, and again in 1940; 1938, 1939, and 1941 on, he lists "no profession." Died in Los Angeles, Aug 15, 1943. If you enjoyed this article, or found it useful for research, please consider supporting Harpguitars.net so that this information will be available for others like you and to future generations. Thank you! All Site Contents Copyright © Gregg Miner, 2004,2005,2006,2007,2008,2009,2010,2011,2012,2013. All Rights Reserved.